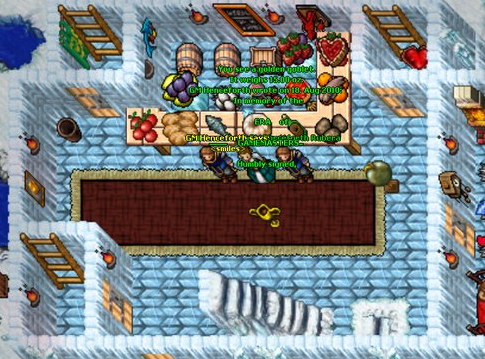 In honor of International Women’s Day, we have the privilege of interviewing the leader of one of the oldest guilds in Tibia(Henceforth Family): Sun Henceforth. Aside from that, the Henceforth Family is celebrating their 14th birthday today! Let’s see what she has to tell us? Masih: First of all, we would like to thank you for accepting an interview with Portal Tibia. Are you ready to answer some questions? Sun Henceforth: I feel honoured. Yes, I’m ready. Masih: Before we start with questions related to Tibia, we would like to know a little bit more about you: Who is the Sun Henceforth behind the computer? Sun Henceforth: I am an older woman from Sweden, who among many other things has Tibia as my hobby. Masih: How did you find or hear about Tibia? What was the first world you started on? Sun Henceforth: The first contact I had with Tibia was in autumn 2003 when I was sitting next to my son (who at that time was only 13 years old) and watched when he was playing. It was in Rubera which was a fairly new server back then. He showed me how to fish and make runes. So in March 2004, I made my own character to be able to fish on my own. Masih: You’re the leader of the Henceforth Family, one of the oldest guilds in Tibia, being in existence for 14 years now! How did you manage to keep the guild active for such a long time? Sun Henceforth: Maybe I’m stubborn. On a more serious note. It has not always been easy and I have been close to giving up several times, but then something has happened that has given me new energy to continue. One of these times was when our guild got a Tapestry of Honour for the first time when Tibia celebrated 15 years. Other times I’ve had a hard time abandoning my members whom I care very much about. I also have to give a great tribute to my vice leaders, of which “Ell Vingadora” is one of those who kept the guild alive during the time where I have not been so active. Masih: How did your guild the Henceforth Family start? 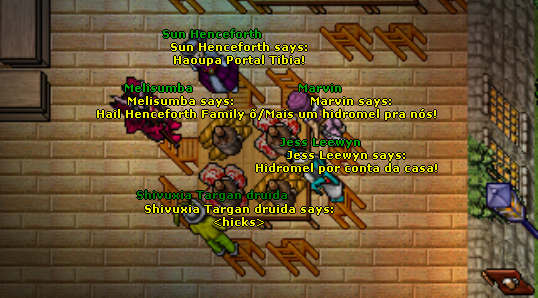 Sun Henceforth: It all started when one of my son’s friends on Tibia came up with the idea of making a guild where everyone had the same name. My son asked me if I knew a good name for their guild, and I searched on the internet for nobility’s names for inspiration and in dictionaries for English words that could fit. After several proposals, they decided that henceforth, which in other words also means “in the future” suited, so they made their first characters for the guild and named them Borr Henceforth, Martin Henceforth, Konflict Henceforth and Telos Henceforth. The first years, no one was allowed to join if they did not make a character named Henceforth. Masih: Could you tell us more about the first leader of the Henceforth Family, Borr Henceforth? Sun Henceforth: He was together with Konflict and Telos one of my son’s first friends on Tibia. He was a roleplayer, who was active as a tutor and also used to write on the old fansite “Tibia News”. During his job as a tutor he became friends with several Gamemasters and after a while, they asked him if he wanted to join them. It was not an easy choice for him because that would mean that he had no time for our guild or to play Tibia with his friends. He asked me for advice. I said it was first of all his choice, but that one of the things he enjoyed most about Tibia was to help others, the Gamemaster role would suit him. He had already handed over the leadership to me a few months earlier, so that was not a problem either. He accepted, and suddenly we had a Gamemaster in our guild named with our name. Of course we were proud of him, otherwise, I would lie, but do not think we became popular on the server because of this. Borr was accused of being corrupt, and many were angry with us. Our members were killed because Borr had banned them. After a while, he decided to not work on Rubera anymore to keep our guild safe. Some years after most players had forgotten about him he was online with his ordinary character Borr Henceforth (not the GM) when he saw a player tell another player ” Look a Henceforth”. He had a lot of fun with that. In a patch released on August 23, 2010, the era of the gamemasters came to an end. The last day Borr was online to give me a memory to keep in our Guild house ” a Golden Goblet” that he wrote on and the Gamemaster doll he got from CipSoft as a reward for his help during the time as a Gamemaster. We still have it in our Guild house. Masih: In the past 14 years you confronted and co-existed with many wars between dominating guilds. How did you deal with this and how has your relationship been with these dominating guilds? Sun Henceforth: Well, the first years we were just a guild among many others. It was easy to find friends because many were as new as us in the game. When they grew up and became leaders in larger guilds, they did not forget about our friendship. Later it became harder when new leaders came because of the transfers and merging. They did not know me but I’m a social person who talks to everyone, and it does not make any difference if it’s a high or low level, with or without power. It took a while, but I think the leaders of the powerful guilds soon found out that I was not a threat to them. Masih: Out of all the stories you have about your guild, could you tell us one that you will never forget? Sun Henceforth: It’s actually two and both from 2004. “Borr Henceforth”, our first leader, notified us about a competition “The global Teddy Bear Quest”, presented by the fansite “Tibianews” and the guild “Rising Dragons” We had such luck and skill that we won first prize. It was given to us by GM Excessus in Thais deposit, and the Teddy is currently in our Guild house. Later in 2004 “Borr” pretty much forced me and some other members of our guild to make characters on Antica to visit the second Tibianic Exhibition(http://tibia.wikia.com/wiki/Tibianic_Exhibition). We were a bit grumpy and thought it was hard to make another character, it took us a week in rook and we were a little stressed to get there in time. It was very exciting, several Gamemasters were there to keep order. The line to the exhibition went through all of Greenshore, over the bridge to Thais. I still have the ticket in my deposit on Antica. Masih: With the time we dedicate to Tibia, we form friendships that can mean a lot to us. Which are the friendships you cherish most? Sun Henceforth: That is probably the hardest question. I cannot pick out anyone. Almost everyone I met and got a relationship with has in some or another way meant something special to me. Masih: You participate in annual meetings in Amsterdam for Tibians to get to know each other in real-life. Could you tell us more about this and when you come up with this idea? How do people sign up? Sun Henceforth: It was started in 2005 by Rody and Nettie, two ladies of my own age who live and work there. I first started to visit it the year after in 2006. Nowadays, it is Eline a younger girl who hosts the meeting. It is usually written about on Tibia’s forum a few weeks before the meeting is held. There is also a Facebook group where you can join if you are interested. Search for “Amsterdam Tibia Meeting (ATM)”. Masih: Thinking about all the past meetings, which one do you have very fond memories of? What is the type of people that come to these events? Have you had members of CipSoft show up? Sun Henceforth: We always have a great fun in all our meetings, and I laugh a lot every time I’m there. Everyone who gets there is taken care of and gets into the community quickly with the feeling like they are among friends. At our 10th anniversary in 2015, we actually had a guy from Brazil who came. He was acclaimed as a rare Tibia celebrity. He lived in Spain for the moment though. Most people who come for the first time, also want to come back next year again. There have been people of all ages ranging from 10 up to 60 and from different parts of Europe. Over the years 3 ex-Gamemasters have been there and yes, even CipSoft staff members showed up at the meeting in 2007. 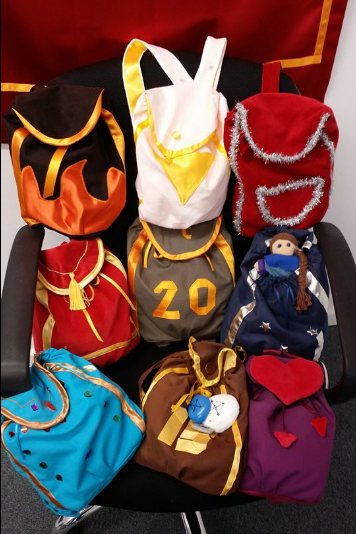 Masih: Years ago, CipSoft posted images of backpacks handmade by you. Could you tell us more about this? Sun Henceforth: I love to create things it’s another of my hobbies. I started to create items related to Tibia in 2007. The first things I made was not so fancy bags, and a pirate tapestry to decorate the venue for the meeting. Over the years, I made more bags and backpacks to have as prizes for the quiz and also other things for decorating. One funny thing is a dragon lord trophy. One year I, just for fun, sent one of the backpacks to CipSoft’s office in Regensburg, and it turned out that they liked it. After that, I have sent more for Christmas and their anniversaries. Now for some quick questions! Masih: A city in the game? Masih: Monster you’re afraid of? Masih: Which city in the game would you like to see deleted? Sun Henceforth: I do not like Kazordoon, but for that sake, I would not want it to be deleted? Masih: For what event in Tibia can they wake you up in the middle of the night? Sun Henceforth: I do not think anything would make me wake up, I’m afraid. Masih: Do you have a final message for the people reading this interview? Sun Henceforth: Take care of yourself. Masih: Thank you so much for this interview! Sun Henceforth: It was a pleasure.